Q1 Why hasn’t the box got electricity or what powers the device if there are no batteries? A1 There are many types of Radionic devices offered for sale in the world. Some devices have electricity and others don’t. The Mind is not physical and the mind takes the whole process out of the time restraints. Eliminate time and processes are accomplished at greater speed, healing can be instantaneous. Science now accepts that the aura of a person exists; it has taken time for scientist to identify this long known fact. It is believed by Dr Harold Saxton Burr, at the prestigious Yale University School of medicine that the aura (Auric Field) or Life Field (later shortened to L Field) is the mind and is the mould that produces the physical body we exist in. If you cannot accept that statement, just hold on to it for later. If you were to introduce electricity into the equation you would also introduce the time factor back in to the system. Don’t get me wrong, there is a place for electricity in radionic boxes, but not if they used as mind machines. The beauty of mind machine radionic, is the time factor is eliminated, hence instant healing or as quick as possible. Q2 What is the difference between the 7 dial box and the 3 dial and the single dial Radionic boxes? A2 The difference between the single, three dial and seven dial radionics machines is to do with the accuracy of obtaining the frequency required. With a single dial radionics box, there is only one dial to obtain the frequency, so the results are not as precise as they could possibly be, unless you are using the single dial radionics box with the handheld Beamer’s as this brings a whole new dimension to the box. If we take a look at the seven dial radionics box, there are two banks of three dials. Each bank of three dials is associated with its adjoining copperplate and the seventh dial in between the two banks of three dials is used to tune the user into the box. So by using three dials we can achieve a much finer tuning of the frequency required. The same applies to the three dial box, one dial is associated with each plate and the centre dial is used to tune the user into the box. Again, only having a single dial associated with the plate it is harder to get an accurate frequency that is required for the job in hand, again unless you are using the three dial version with the handheld Beamer’s. 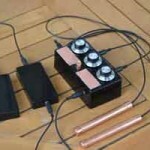 Electronic radionics machines are ideal if the time factor is not important. This is ideal for eradicating pests from crops or changing weather patterns etc. These scenarios are actions in present time, in the moment, so the time factor cannot or does not need to be shortened. 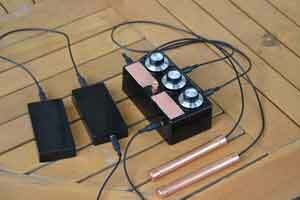 If you are using an electronic radionics machine for healing the normal timeframe or recovery would be expected. The healing is still achieved, but the time frame has not changed from conventional healing.